In summertime, soaked muesli is just about the best breakfast one could have. It is refreshing and cool. Who wants to start the day hot? Some of us will have an egg or two also, but this is the main course. Muesli is as simple as can be. It combines the traditional, necessary step of soaking (to neutralize anti-nutrients and improve digestibility) with the ease of a put-in-your-bowl-and-add-milk instant breakfast. This week, we have the most wonderful local fruits to top our muesli, and we are enjoying that fully. But even without those, adding dates, raisins or figs provides a nice chewy texture along with sweetening. You must start this dish the night before and it takes less than 5 minutes to assemble. The next morning, it is ready to eat – scoop into a bowl, top and serve! This amount serves my family of five. Combine oats, water, and kombucha, kefir, yogurt, buttermilk, or whey in a bowl. Mix. Add spices, dried fruit, coconut and nuts. Cover and allow to soak for 7 to 8 hours, or overnight. When ready to serve, scoop into bowls and garnish with fresh fruit and milk, yogurt or kefir. Enjoy! Let's talk price, aiming to keep this dish's total cost around $5. It is hard for me to figure cost and truly, cost is not that important to me. I would rather pay significantly more for good food, than pay anything at all for conventional food. However, it is a good exercise to figure out an approximate cost. The oats are purchased in bulk and I would approximate their cost at about $1.50. I make my own Kombucha and kefir (and whey, dripped out of the kefir), so they are low cost – about $.03 for 6 tablespoons. The milk products come from our own goats – a high estimation would be $2 per gallon. If we use a quart for this meal, as topping in whatever form (kefir or plain milk), that is $.50. Buying seasonal, local fruit is inexpensive, about $1 to $2 per pound at a U-Pick or right from the farm. Let's say we use a 1/2 pound at $2, so $1. This post was featured in 90 Nourishing Egg-Free Breakfasts. I really need to get to some farmer’s markets for some in-season fruit! Living in central Oregon makes its tough to get inexpensive local fruit, especially this early in the summer. We did start our own strawberry patch this year and have gotten a few yummy Oregon berries, but would need it to be about 5 times in size to get some everyday. We have also been enjoying homegrown lettuce and spinach this week and its delicious. Christie – It is true that our locations present different opportunities! I think it is wonderful that you have your own strawberry patch, lettuce and spinach! I keep wanting to try this but I keep forgetting to put my multigrain on to soak before I go to bed! .-= gilliebean´s last blog post… Eagle Rock ‘n’ Roll Farmers Market =-. Cool! You used kombucha to soak your oats. Will have to try this for sure! 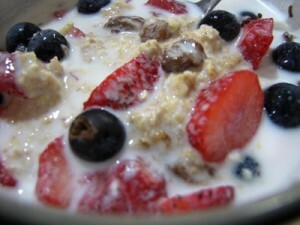 I had only heard about the more traditional ways of soaking muesli (yogurt or buttermilk). Thanks for the great idea! .-= Kimi @ The Nourishing Gourmet´s last blog post… Pennywise Platter Thursday 7/8 =-. Kimi – I started doing that when I didn’t have whey or milk products, and wanted to avoid the sour taste of lemon juice or apple cider vinegar. It works great! This sounds like a must try for me. How refreshing a breakfast, especially during the hot summer mornings! I like the idea of using kombucha as the acid medium. Wow! This sounds wonderful…and wonderfully easy, which I could use these days. I was confused by the name, thinking that you must be talking about some other sort of grain, and not simply my beloved oatmeal! This is going to be on the menu soon at my place. .-= c´s last blog post… Knowlege Is Power =-. You’re photograph is beautiful – looks so appetizing. One question…the oats are not cooked at all? I make granola regularly. I like the thought of not baking my oat mixture. .-= Bethany´s last blog post… Water Play =-. Bethany – no the oats are not cooked at all, just soaked overnight. 🙂 Enjoy! Wardee, does this museli take on a sour taste after being soaked all night? When I make soaked oatmeal, I usually use lemon juice because the kefir makes it taste too sour for us in the morning. My husband especially doesn’t like it but we all love muesli. Just wondering if you could let me know the sourness of this 😉 if that makes sense. Thank you! Kami — It will be as sour as the you usually make. If you’re concerned that is too sour, you could always drain and rinse the oats, having soaked only with water/acid. Then add the fruits, nuts, spices, etc. in the morning after draining/rinsing. I was wondering if you let this soak overnight in the fridge or out on the counter? Thank you! Jessica — Out at room temperature. Hey Wardee, question about this. If I like a “crunchier” taste would it work to soak and then dehydrate and just add milk when I want to eat it? I tried this and just can’t get past the mushier texture..could just be something I’ll grow to like but thought dehydrating might work after soaking?